Hello my friends. I see we have all chosen to meet on this odd little planet, in the middle of the Milky Way Galaxy. What odd creatures these humans are! Many of them share characteristics with us, but they seem to be missing…something…I’ve yet to put my finger on what is missing. Of course, some of us have horns and scales, but it’s more than that– they’re missing a certain….spark? A spark, yes, that it’s! We alchemists, we have the spark! Here on earth these people have science, chemistry (something that is not unlike our own art), but many of them lack wonder. They have such wonderful inventions in their hands, and yet they do not wonder. While some of us believe in a magic of sorts, others believe in the magic of the mundane. These humans, they look at the medicines they have, the technology they use, and they are not amazed. What is more magical, more alchemical, then the transformations of everyday life! They have machines that connect them to a global web– I am told it is called the internet, and yet they still think they have such little power, such little influence. How far they are from the truth! My name, friends, is Avicia– taken from the word Avis. In my language, not unlike your ancient language, “Latin,” it means bird. I love the symbol of the bird, flying and free— my animal sidekick is a phoenix, his name is Ardashir and he is my faithful companion. 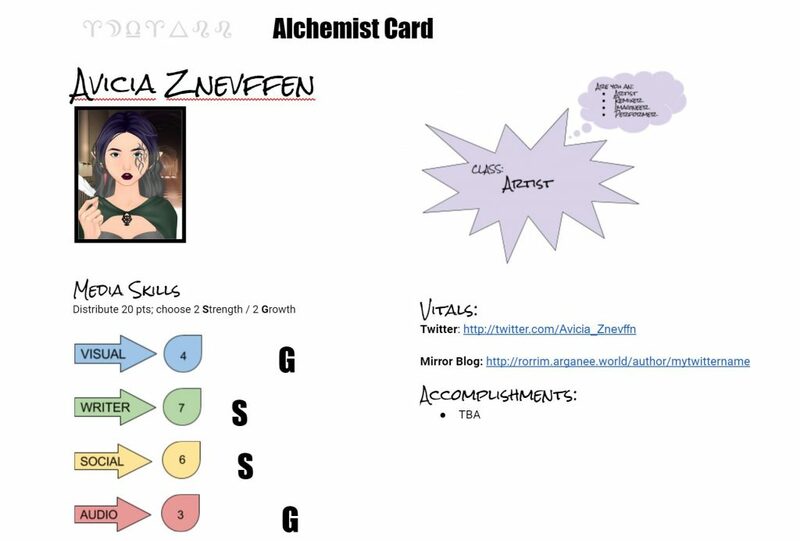 As you may see above in my Alchemist card, I am an Artist. You may have heard artists described as those whose work seeks to capture attention, provide commentary, and provoke emotion about the world around them, and this is how I like my work to speak. I like to weave together words in search of truth, to break down meaning and, above all, to seek justice through kindness. I believe that greatest stories we tell are in relation to one another: the connections we make, the lives we enhance, the people we draw up to walk beside us. I believe in the connection of community, and the pen (or, as this world has, the “keyboard”) as power. As for my skills I am, above all, a writer. Writing is the strongest of my skills although I have found that this skill ties in well with what the humans call “digital media.” Rebeg Maestro and M. Prophetissima have introduced us all to Twitter and “blogs,” such as this, and I believe I have found my way around these quite well. Due to this, “Writer” and “Social” are my two strengths. Artists see the worlds as they should be, not as they are. Writers tell others.